The descending tracts, also known as the motor tracts, are responsible for movement. The descending tracts involved in voluntary movement are known as the pyramidal tracts and originate in the motor cortex. The descending tracts involved in involuntary movement are known as the extrapyramidal tracts and originate in the brain stem. This article will cover the origin, course, and function of the pyramidal and extrapyramidal tracts. The pyramidal tracts begin in the motor cortex (pre-central gyrus), an area of the frontal lobe. The motor cortex is responsible for the planning and execution of voluntary movement. The motor homunculus is a depiction of the density of neurons in the motor cortex dedicated to different parts of the body. Furthermore, the blood supply to the motor cortex explains patterns seen in stroke. Occlusion of the middle cerebral artery causes primarily facial and upper limb weakness, whereas occlusion of the anterior cerebral artery causes primarily lower limb weakness. Premotor cortex – primarily involved in planning of movement and incorporation of sensory information into movement (e.g. proprioceptive location of the limb and the visuospatial location of an object). Supplementary motor areas – primarily involved in posture and in the coordination of the sequence of movement (e.g. the order in which muscles should contract to pick up an object). Primary motor cortex – contains neuronal cell bodies called cells of Betz which contribute to the descending motor tracts and is primarily involved in the execution of movement (e.g. picking up an object). 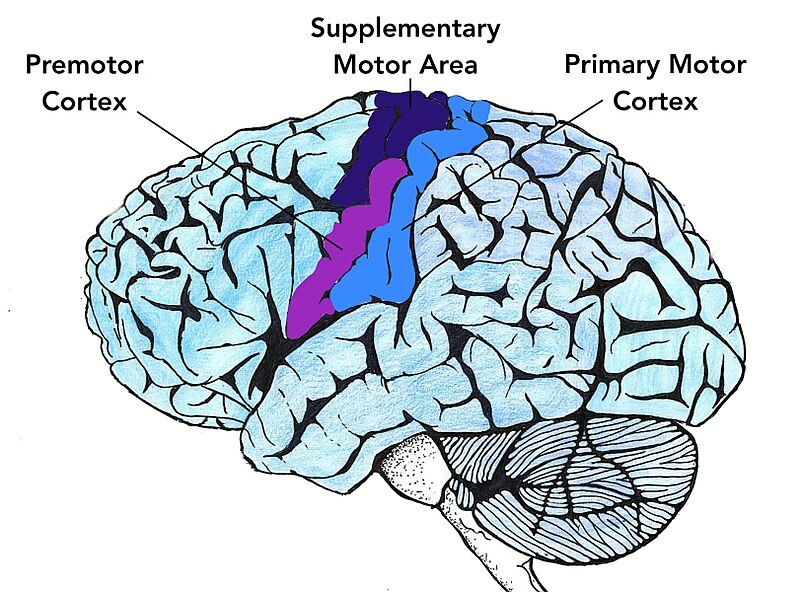 Fig 1 – Diagram of the brain showing the location of the motor cortex. The cell bodies of the pyramidal tracts are located in the motor cortex. There are two major pyramidal tracts known as the corticospinal and corticobulbar tracts. Note: strictly speaking the corticobulbar tract is not a pyramidal tract since it does not cross through the pyramids of the medulla. However, since it is functionally similar to the corticospinal tract, they are often both termed pyramidal tracts. The corticospinal tract is responsible for the voluntary movement of the contralateral (opposite) side of the body. There are two corticospinal tracts – the lateral corticospinal tract which forms 90% of the corticospinal tract and the anterior corticospinal tract which forms the remaining 10% of the corticospinal tract. Since the corticospinal tracts decussate before synapsing with their lower motor neuron, any injury to the brain affecting the motor cortex will affect the contralateral side of the body. 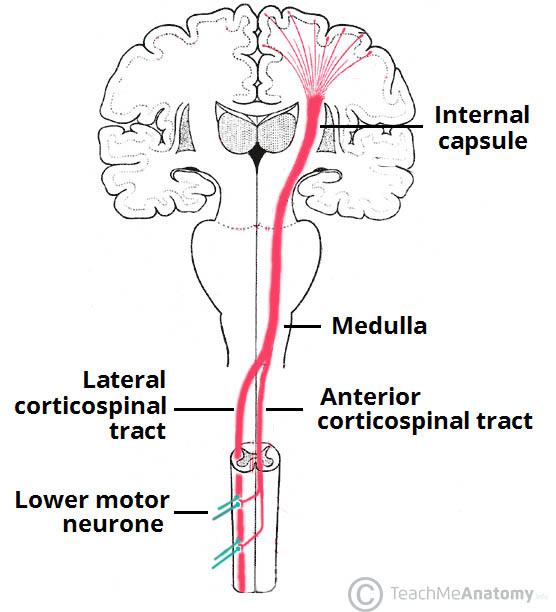 Fig 2 – The corticospinal tracts. Note the area of decussation of the lateral corticospinal tract in the medulla. The corticobulbar tract is responsible for the voluntary movement of the head and neck. It contains the upper motor neurones of the cranial nerves. Begins at the motor cortex. Passes through the internal capsule. Synapse with lower motor neurones (cranial nerves) at the brainstem. The facial nerve (CN VII): The facial nerve has two branches, one which supplies the upper face and one supplying the lower face. The branch supplying the lower face does not receive bilateral innervation from the corticobulbar tract. It only receives innervation from the contralateral motor cortex. Therefore, in a stroke affecting the right side of the brain there will be paralysis of the lower part of the left face. This contrasts with Bell’s palsy (injury to the lower motor neurone – the facial nerve itself – where there is paralysis of the entire side of the face on the same side of the lesion). The hypoglossal nerve (CN XII): Each half of the tongue is supplied by the contralateral upper motor neuron. In an injury to the right motor cortex, the left side of the tongue will be affected. The result will be deviation of the tongue to the left (since the tongue muscles push the tongue in opposite directions to achieve protrusion of the tongue). Fig 3 – The corticobulbar tracts. This is a simplified diagram that does not demonstrate the bilateral nature of these pathways. 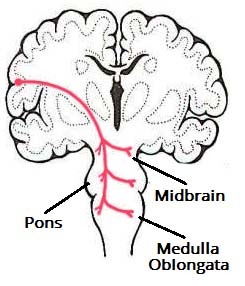 The extrapyramidal tracts begin in the brain stem (midbrain, pons, and medulla). They are responsible for involuntary movement. There are four major extrapyramidal tracts. The tectospinal, vestibulospinal, reticulospinal, tectospinal, and rubrospinal tracts. The tectospinal tract originates in the midbrain and decussates before terminating in the cervical spinal segments. Its function is to change the posture of the body in response to visual and auditory stimuli. The vestibulospinal tract originates in the medulla and continues ipsilaterally down the spinal cord. It is responsible for head balance and turning. The pontine reticulospinal tract originates in the pons and descends ipsilaterally down the spinal cord. It is responsible for controlling the extensor reflexes and extensor tone. The medullary reticulospinal tract originates in the medulla and descends ipsilaterally down the spinal cord. It is responsible for controlling the flexor reflexes and flexor tone. The rubrospinal tract originates in the red nucleus of the midbrain and decussates before continuing down the spinal cord. It is responsible for allowing the ability to isolate movement of one joint. Furthermore, although part of the extra-pyramidal system, it is thought to contribute to the voluntary movement of the hands and feet. Upper motor neuron syndrome is a combination of signs seen in patients with an upper motor neuron lesion e.g. stroke. Caused by damage to the motor tract that innervates muscles. In the upper limbs the extensors are weaker and so affected the most. In the lower limbs the flexors are weaker and so affected the most. Due to loss of inhibitory signals. Spastic catch – the increased tone is velocity dependent i.e. if the examiner moves the hand slowly then there is little resistance but if the examiner moves the hand quickly there is a point where there is a sharp resistance. Clasp-knife reflex – if the stretch is strong enough an autogenic (self-generated) inhibitory reflex is initiated within the muscle causing sudden drop in tone. Caused by loss of inhibitory signals. In the upper limbs the flexors (biceps) are stronger than the extensors (triceps) and so the arms rest in a flexed position. In the lower limbs the extensors (quadriceps) are stronger than the flexors (hamstring) and so the legs rest in an extended position. These features cause the spastic gait typically seen in patients with stroke. Abnormal extension of the great toe on stroking the sole of the foot (upgoing plantar / Babinski positive). Normal in infants since the corticospinal tract is not yet fully developed. Caused by loss of inhibitory signals of upper motor neurones. The stretch reflexes are exaggerated. Re-excitation of these reflexes may contribute to clonus which is a rhythmic contraction and relaxation of muscle in response to stretching, commonly seen at the ankle.